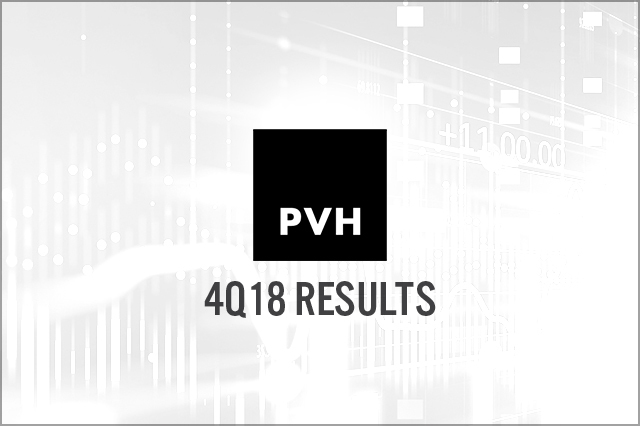 PVH 4Q18 revenues declined 1% to $2.48 billion, as an extra week in the year-ago period and a calendar shift reduced revenues approximately $125 million. Adjusted 4Q18 EPS rose 16.5% to $1.84 versus $1.58 in the same period last year and the $1.76 consensus estimate. Tommy Hilfiger is the stallion in PVH’s brand portfolio, achieving 5% revenue growth (constant currency), 16% comps internationally and 5% comps in North America (NA). The outlook for 2019 includes adjusted EPS of $10.30-10.40 versus $9.60 in the same period last year and includes $0.22 in negative currency impact.